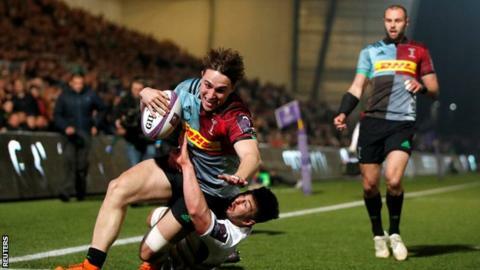 Harlequins twice came from behind to win a tense game at Worcester and reach the European Challenge Cup semi-finals. After trailing 8-5 at half-time, the hosts twice led, first through Tom Howe's try, then Duncan Weir's penalty. But, after converting Ben Tapuai's try to put Harlequins back in front, Demetri Catrakilis again kept his nerve with the boot, just two minutes after Weir had appeared to have won it. Bryce Heem had earlier cancelled out Quins' first try, from Cadan Murley. Three-times winners Quins now play the victors of Sunday's last quarter-final in France's Massif Central between Clermont Auvergne and Northampton. Quins were first on the board with the game's opening try on 17 minutes when two missed tackles allowed winger Murley to get over in the right corner, although Marcus Smith failed with the conversion. Within seven minutes, Warriors were level when, from the base of a scrum close to the posts, Weir switched to the left and delivered a pinpoint kick to the corner which the unattended Heem caught to touch down. Weir also missed his conversion attempt and, instead of Warriors going ahead, it was Quins who did when Smith kicked a penalty on 37 minutes. And, when Weir wasted the chance of an immediate reply when he missed a long-range effort, Quins turned round in front. Chris Pennell's superb grubber kick into the left corner earned Warriors the lead when Howe timed his run superbly to collect and score, and, although Weir's conversion hit the post, he nailed his first successful penalty for a 13-8 advantage. But Quins responded and from Danny Care's kick through, Tapuai collected to level the scores again, before Catrakilis' conversion edged them back into the lead. Weir's second penalty seemed to be crucial on 74 minutes when it put Worcester in front by a point, but Catrakilis came up with an almost instant response to send Quins into the last four. Worcester: Pennell; Heem, Te'o, Mills (capt), Howe; Weir, Hougaard; Black, Annett, Milasinovich, Fatialofa, Phillips, Kirwan, Lewis, Cox. Replacements: Taufete'e, Waller, Kerrod, Barry, Du Preez, Heaney, Van Breda, Venter. Harlequins: Brown; Murley, Alofa, Tapuai, Chisholm; Smith, Care; Boyce, Elia, Collier, Merrick, Horwill (co-capt), Bothma, Robshaw (co-capt), Clifford. Replacements: Crumpton, Auterac, Ibuanopke, Glynn, Luamanu, Hidalgo-Clyne, Catrakilis, Saili.